Invisalign is a commonly discussed orthodontic treatment for those looking to straighten their smile without the use of traditional braces. While there are clear benefits to choosing Invisalign, many wonder if the option is really worth the cost? Although Invisalign can cost more than traditional orthodontic treatments, the benefits the clear braces offer make the option worth the cost. As your cosmetic dentist in Horsham, we offer Invisalign to our patients. If you’re considering Invisalign, we have the information you need to make an informed decision. Invisalign is a type of orthodontic treatment that doesn’t require metal brackets or wires to move the teeth. Instead, custom-made clear aligner trays are used to gradually align the teeth. The trays are created in a series based off of images and scans taken of the mouth. Each tray in the series is worn for about two weeks, at which point you move onto the next tray in the series. As you progress through each tray, your teeth are slowly moved into their correct position. On average, treatment with Invisalign lasts about 12 months; however, the length of time needed varies depending on your exact needs. 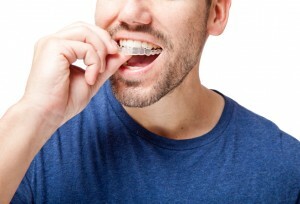 Once treatment is complete, a retainer is needed to prevent the teeth from moving back into their previous positions. What are the Benefits to Invisalign? Invisalign offers a nearly invisible treatment options that’s removable. Since the trays are removable, there are less restrictions than those associated with traditional braces. This also makes oral hygiene easier because you don’t have to brush and floss around wires and brackets. Invisalign is also more convenient than traditional braces. You’re able to progress through each tray in the series without having to visit the dentist for adjustments. Instead, just come in every 4 to 8 weeks so we can monitor the progression of your treatment. Overall, Invisalign offers a discreet and more comfortable means to get a straighter smile in less time than with traditional metal braces. The cost of Invisalign varies considerably depending on your treatment plan. A rough estimate of the cost of the treatment is about $3,500 to $8,000 through the manufacturer. This is compared to the average cost of traditional braces in the range of $2,500 to $6,000. However, as previously mentioned, the cost of your treatment varies considerably based on your individual needs. In some cases, insurance plans may even help cover the cost of the treatment. Plus, many dentists offer payment plans to make the treatment more affordable with flexible payment options. Horsham Dental Elements offers Invisalign in Horsham for those wanting a straighter smile with a nearly invisible option. As a cosmetic dentist in Horsham, we will perform a complete evaluation to determine if Invisalign is right for you. If you’re a candidate for clear braces, we create a customized treatment plan to give you the straight smile you’ve always wanted. We’ll give you the alternative treatment you want with Invisalign. Comments Off on What Do Invisalign Braces Cost?